Now the former Air Force captain wants to make sure other women veterans don’t wait that long. She’s pushing officials from the Army and Navy implement a successful Air Force program to increase awareness of gender-specific health care programs for service members, linking them with resources during a critical transition time. The effort — which has the support of 33 other members of congress, including 28 fellow Democrats — is a small but significant step in improving the military’s approach to its changing demographics. The first-year lawmaker is hoping that while she pushes for more ambitious reforms in the coming months, modest moves like this can have significant results in years to come. 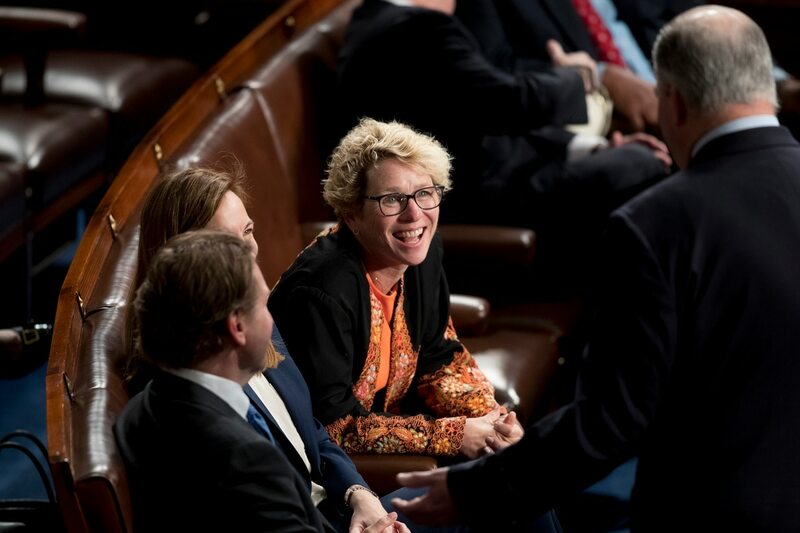 Houlahan sat down with Military Times recently to discuss her experience in Congress as one of the new class of women veterans elected to office (at seven, it’s the largest in congressional history) and her goals as a member of the House Armed Services Committee. How much work needs to be done to bring awareness to women veterans issues? It’s not a coincidence that you see a lot more women veterans in Congress right now than you have before. I was at the earlier edge of that, I’m one of the oldest new members who have a military background. I’m the only (female) veteran that I’m aware of who is a pre-9/11 veteran. I think you have this generation of women veterans who were able to take advantage of some of the loosening of regs and restrictions, and have a real career. That has qualified them in some ways to be here now, the right timing come into Congress now because their record of service was compelling enough for people to vote for them. So now, these women of Congress with service, we come from all over the country. We were the tip of the spear in many ways, and the demographics of our military is changing pretty rapidly. This (effort) is about a program the Air Force tried … and saw it was successful in motivating women to access veterans benefits. The Army has tried it in a smaller situation. This is just an idea to continue that thing that worked, and statistically reduces suicides, definitely increases the number of people who are accessing benefits as women. And as (women) become more and more of the veterans population, that’s just common sense. Is the military doing enough for women? When I was active-duty, I wanted to be a pilot, got an active-duty pilot slot, but decided not to take it. My path was different, because I would have been doing things behind the scenes in piloting. But now you can see Mikie (Sherrill, a New Jersey representative), a helicopter pilot, and Amy (McGrath, a Kentucky House candidate), a jet pilot. You can see the progression of the doors opening. It’s not just that our faces have always been there. What we got to do has changed, even within the 10 years I left the military and they joined. They had different career opportunities than I had. It’s because what the women are doing is fundamentally different than what we were doing before. Critics argue that the current department motto ignores the contributions of women in the military. You’ve promised to be an advocate on military spouse and family issues. How do you make sure to keep the focus on them? When I separated, one of the bigger reasons was because I could not see a path where that (career) was sustainable. Thoughts about what a spouse looks like (in the military) should change, because a spouse isn’t going to be just like my grandmother — Navy wife — or my mom — Navy wife. That was their career. We need to be thoughtful about how we treat spouses, regardless of their gender. They need to be make sure they can have livelihoods and careers and individual thoughts and feelings too. I’m on the readiness subcommittee. It’s deliberate, as someone who has served and whose parents and grandparents served, that I think these issues of readiness include families, include moms and dads and kids. Your district is the first in Pennsylvania for defense contracting dollars. How does that influence your priorities in Congress? I lived in my county in Pennsylvania for 25 years, and I’m a former member of the military, and I had no idea there was that much connection. It’s supply chain business. On the civilian side, what I did was growing small businesses to mid-sized businesses, and I was the operations officer. So, logistics, manufacturing, production, that’s what I did. So this is why I think it’s awesome to be on the small business side of things too. You look out my window at home, and you see some small businesses and mid-sized businesses that are supplying not just the defense industry, but all industries. And so whatever we’re looking at — cyber issues, procurement issues — as it applies to the military side of things, you’re probably seeing the same problems that small businesses and mid-sized businesses are seeing on the non-military side of things. How familiar are members on Congress with how VA and the military works? We need more military members in Congress. It has been significantly better historically than it is now. We need them there not only because they have first have experience serving and understand the mechanisms of our budget, but we also need them there because frankly they are team players and problem solvers in ways other people aren’t. We need more women in Congress for similar reasons. We need more diversity in Congress in general. Have you had a chance to talk to veterans across the aisle in Congress? I helped form a new caucus. It’s called For Country, it’s a bipartisan, veterans-based caucus. And we are committed to working across the aisle on things we can agree on. One of those things is the importance of national service, not just military but Teach for America, City Year, Peace Corps and those kinds of things that bring people together and advance the country. We’re also committed to sit down and talk through ideas. If I have a legislative idea that may not be on Armed Services or Foreign Affairs, we can say, ‘Hey, would you be interested in sponsoring this with me?’ It’s a conduit to potential co-sponsorships, and at least we have a relationship.